Researchers at the Libertarian Cato Institute made headlines last month by claiming that welfare recipients are a lot better off than minimum wage workers. A lot of people want to work, the study suggested, but when you can make the equivalent of $35,000 in benefits, you’d be crazy to take a job on the lower rungs of the wage ladder. Ergo, government largess has made poor people dependent on the dole. By the time Archie-and-the-debunkers fire up, of course, no one is paying attention, so the study’s authors won’t have to face the music and dance. People who work in ‘Think tanks’ are rarely paid to think; they are reimbursed for providing facts to match the prejudices of whoever pays the piper. Josh Barro has been called a libertarian, a conservative and a liberal, but he’s actually a center-right thinker who doesn’t buy anyone’s orthodoxy. That’s the hopeful thing about blogs; in theory at least they free opinion from the constraints of moneyed interests . . . assuming that anyone is listening. I have never understood the appeal of libertarian thought. Sure, applying simple market principles to the war on drugs can be highly instructive. And the libertarian suspicion of our costly imperial-military machinery resonates with me. But the idea that government intervention inevitably makes things worse is horribly simplistic. Bad public policy, liberal or conservative, produces bad results and we have seen plenty of both. I get the bit about unintended consequences and all that. But unrestrained capitalism leads inevitably to a binary world of winners and losers. We need a healthy middle class, and we need to help our most vulnerable citizens find a piece of the prosperity, if they are able to work, or help them survive, if they cannot. I am particularly curious about why young Texans find libertarian thought so attractive. Over the weekend, my son Adam shared a theory. He said young white people in Texas who are socially liberal don’t want to be associated with the Democratic Party so they embrace the libertarian alternative. Even Texas women who vote for Democrats, Adam said, prefer to marry Republican males. In Texas, only minorities and white weirdos vote for Democrats (unless you are fortunate enough to live in Austin). In states like Mississippi, Louisiana and Alabama, approximately 10% of white people vote for Democrats. Move outside university towns and I suspect the percentage drops below 5%. It’s not quite that bad in Texas, largely because we have several urban centers large enough to support white liberal enclaves; but if you move into the suburbs, exurbs and small towns of Texas, it’s hard to find white Democrats under the age of 70. When everybody you know votes Republican, policies associated with the Democratic Party (public assistance programs, Obamacare, etc.) are viewed as wrong because they are odd. It’s like we are all back in Junior High School, scared stiff to wear the wrong brand of jeans. Voice a compassionate opinion that doesn’t demonize poor people and the room goes quiet. This attitude assumes that Black and Latino Americans are brainwashed, mistaken or dependent. Consider the following research from the Brookings Institute. 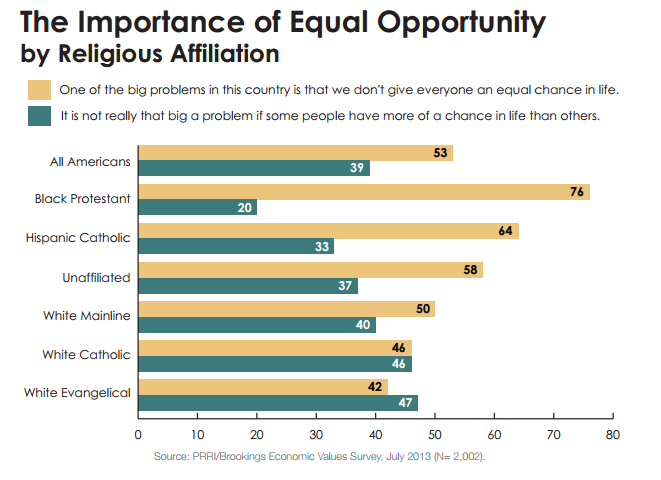 76% of Black Protestants and 64% of Hispanic Catholics believe that “one of the big problems in this country is that we don’t give everyone an equal chance in life”. Only 42% of white evangelicals and 50% of white mainliners agree. These are national figures–restrict the data to the Southern tier of states and I hate to see what you’d find. Or consider this graphic. 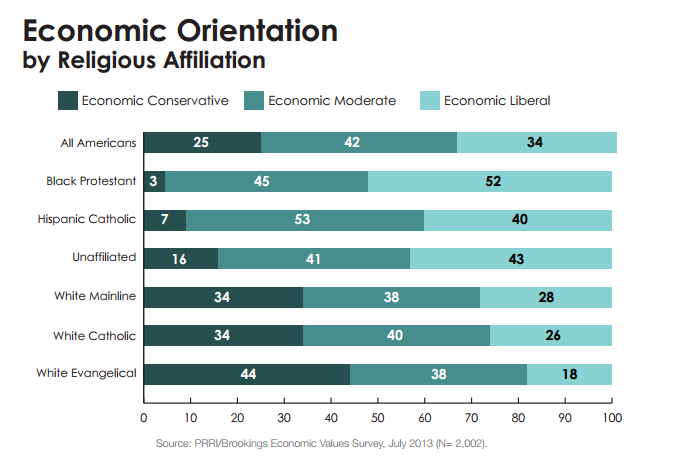 Only 3% of Black Protestants and 7% of Hispanic Catholics call themselves economic conservatives. With white moderates it is 34% and with white evangelicals it’s 44%. Again, in the South the disparity would likely be much larger. Religion is trumped by ideology. What percentage of white people in small Texas towns are economic liberals? In many communities I suspect it would be hard to find more than a dozen . . . and they will be considered odd. This isn’t primarily about the strength or weakness of ideas; it’s about tribalism. It’s about race-based branding. People are attracted to small government conservatism because if you want to fit in there is no alternative. (The phenomenon works in reverse in Harvard Yard and liberal bastions like New York City and San Francisco.) We choose our politics the way we choose our fashion accessories, and for much the same reason–we want to look good by being conventionally fashionable. So when the Cato Institute tells us that welfare recipients are living on $35,000 a year in government handouts we are inclined to believe it. It sounds right. It feels right. That’s the sort of thing people in my circle have been saying. It reinforces my worldview. So it must be right. Right? They add up benefits available through eight programs to a low-income woman with two children, and find total benefit values well in excess of full-time minimum wage work, or even, in some states, middle-skill work. The study is called “The Welfare-Versus-Work Tradeoff,” and it’s meant to show why people don’t get off welfare. And it’s B.S., for three reasons. 1. Very few people actually qualify for all eight of the programs Cato looks at. Particularly, Temporary Assistance to Needy Families (cash welfare) and housing assistance can provide some very expensive benefits. But fewer than two million households get TANF and only about four million get housing assistance. It is much more typical for a welfare beneficiary to be getting SNAP (food stamps) and Medicaid (health insurance), but no assistance with housing or cash. So, the typical welfare benefit is much lower than Cato makes out, making staying on welfare less appealing. 2. Welfare benefits for single adults are much less generous than those for women with children. 3. Not all benefits are lost when a welfare recipient starts working. SNAP benefits phase out gradually with rising income. People who go back to work don’t necessarily lose health benefits, either. Some get new health benefits through work. The children of low-income uninsured workers qualify for the Children’s Health Insurance Program in most states. In some states, low-income working adults even qualify for Medicaid. So, going back to work doesn’t mean nearly the loss of benefits that Cato implies. That said, poverty traps are real. This is the phenomenon of people losing benefits as they earn more income of their own. It’s a problem that welfare programs need to be designed around, and there are two ways of mitigating it. One is to make benefits more generous by extending their phaseout ranges, so people don’t lose as many benefits as they earn more income. That costs money. The other is to reduce benefits. That reduces the standard of living for the most vulnerable people in America. It’s easier to make an argument for the latter approach when you have an economy that creates broad prosperity and makes it easy for people to find living-wage jobs if they are willing to work. We don’t have that economy. This is the problem that conservatives and libertarians refuse to grapple with: If you’re unwilling to support policies that promote macroeconomic stability, such as counter-cyclical fiscal and monetary policies, you’re only making a more generous welfare state more morally necessary. Meanwhile, Democrats have implemented a reform that actually does help to address the poverty trap issue. The Affordable Care Act, when it’s implemented next year, will make it possible for people on Medicaid to go back to work without fearing loss of health insurance. It will turn what benefit cliffs exist in the Medicaid program into a gradual slope, so nobody will have to fear that an extra dollar of income will make them uninsured. That is, the Affordable Care Act will do this except in Republican-led states that are rejecting the Medicaid expansion. In those states, the welfare-versus-work tradeoff will be more tilted toward welfare, and a cliff in Medicaid benefits will still be providing a disincentive to take a job. That’s because conservatives and libertarians don’t really care about the poverty trap, much as they may talk about it — they just hate spending money on the poor. I will buy part of your suggestion on why libertarian ideology is becoming more popular, but I would also add they recognize the need for limits on public power, even if they don’t see as much need for limits on private power. Liberals seem to have the opposite problem. Those of us who see the need for limits on all kinds of power don’t seem to have much of a political movement going. David: Good thoughts. I would suggest, however, that at the moment the folks who benefit most from our economic system are exercising the real control while the politicians serve as useful puppets. Like you, I am suspicious of all forms of power because I am realistic about human nature. Money limits the range of ideas that are permissible on network news. In some cases, this is simply a matter of public demand for a certain form of infotainment; but increasingly, people of means simply buy a microphone. I am not suggesting that ideology is simply a reflection of group identity; but the wide fluctuation in public sentiment by region and racial group suggests that social conformity is one of the most powerful engines pulling the train. Black and Latino Democrats, in Texas at least, are often mainstream professionals. Most of the white Democrats I know who are younger than 70 are atypical outliers and see themselves as such. If you’re a conservative Republican, that’s good news. But my primary concern is that the political game is being driven by racial and tribal allegiance rather than by a thoughtful issues debate. Or, more accurately, that issues are seen through the lens of racial and tribal identity. Most of the Black and Latino evangelical pastors I know who once voted Republican are beginning to feel used. That’s not healthy and anyone with an interest in real racial reconciliation should be deeply disturbed by the trend. In a book I read about U S politics in the late 1800s and early 1900s, the mantra of progressives was “the rich get richer and the poor get poorer”. Does that sound familiar? A favorite of William Jennings Bryan, “we’re being crucified on a cross of gold”. Now nearly all poor families have television, air conditioning and and a lot of poor kids cannot read, but wear $150 Nike shoes. Our federal government has grown so large and intrusive, public school teachers are opting out, taking early retirement, some from our Sunday School class. Some doctors are, too. Bureaucratic harassment is making it difficult to run and build a business. Senator Tom Coburn, in his book, The Debt Bomb, tried to obtain an inventory of U S Gonernment programs and found a maze of duplicate programs. For example, he found 47 different job training programs run by different departments, some unaware of the others. He learned members of congress find starting new programs enables them to give the impression of solving problems and be reelected. I Googled Federal government departments and found, with some duplication of listing, over 500. As a sales representative, doing business with drug and grocery wholesalers and chains, I was privy to some of the interference by government agents that served no purpose other than job activity, some of it costly to the businesses.